Right angles are scarce in this wedge-shaped floor plan, but there is one room that is actually square. 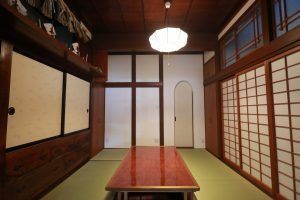 It’s a Japanese-style room in the back, with a traditional tatami-mat floor and sliding doors with panels of rice paper. Above these doors are panes of Diamant glass, an extremely transparent glass with a low iron content. In olden times, buildings were so close to each other that they blocked the sunlight, so this special glass has been mounted in this position to let in as much daylight as possible. Inside this room you see a Shinto altar and a Buddhist altar, the focal points of ceremonial occasions that were observed at home, along with social events and get-togethers. This room was the center of family life, for the rice store was not only a shop but also a home, often shared by three generations – grandparents, parents, and children. 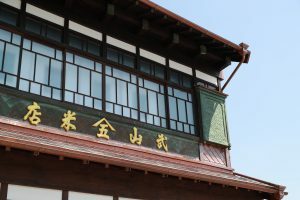 When you look at the façade of the main building, you see an appealing face, a blend of new eaves and old-fashioned Japanese kanji characters that spell out the store’s name. And you know you’re going to see some unusual features inside. So come in and look around! As you enter, the first thing you notice is the skill of the original builders in fitting a structure into a narrow wedge of land. There are odd angles everywhere. The interior is like a geometry class gone wild. But there’s nothing wild about it; everything fits perfectly for a building that couldn’t be rectangular. Challenged by an odd-shaped lot, the builders created an odd-shaped design that delights the eye and defies the tsunami. An ancient clock on the far wall catches your eye – and your ear; it’s still ticking. It, too, is a survivor, counting the minutes and hours since around 1900. In the great fire of the Taisho era, it was the first thing rescued from the building. When the second great fire raged during the Showa era in 1929, only the clock and a small family altar were saved. A nine-year-old boy carried the clock on his back to safety at a relative’s house. Then on March 11, 2011, the deadly tsunami drowned this room to the ceiling. When the water retreated, the old clock was found on the floor, caked with mud but eager to tick again. It has counted the hours ever since. Under the modern paving stones of the annex lies the original doma of the main building before it was moved, a dirt floor pounded solid by generations of busy feet. But there’s more underfoot here than just a kitchen floor. We are standing on landfill laid down in the 18th century. Layer upon layer of earth has been hauled into this area over the years to create dry land, extend the shoreline, and shape it to human needs. The inner harbor area is called the Naiwan district, and most of it is a landfill site, a feature unique to this part of the city. It’s a distinctive district, with both residential neighborhoods and a trading port. In earlier times it knotted three threads of commerce: the old east-west road, the north-south coastal route, and the sea lane. Goods flowed in and out by boats, wagons, draft animals, and the strong backs of porters. Exports of seafoods, timber, tobacco, and silk; imports of furniture, tools, and machinery – such was the commerce with faraway markets such as Edo, known today as Tokyo. The Naiwan district was the crossroads, and it grew and prospered. Look at a map of Kesennuma’s waterfront, and you’ll see a zigzag of straight lines. Only the little Cape Shinmeisaki with its ancient shrine keeps a remnant of the water’s edge as it was in olden times, a rocky reminder of what our shoreline looked like before we drew a new one better suited to our shipping and commerce. From the inner harbor, run your finger westward on your map for about a mile. There’s our railroad station and the name Furumachi, meaning “old town,” which tells you it’s the site of the first village built here many generations ago. Back then it stood near the water; your finger passed over landfill built up gradually since then. There are three keys to the prosperity we have built here, and landfill is one of them. Why landfill? Because of the wind, the second key. Wind filled the sails and drove the watercraft of the Edo period, when sailboats were mainstream. In Kesennuma, the northwest winds blow down from the Mount Murone heights, so filling the land and moving the shoreline helped to position the port to take better advantage of these prevailing winds. The wind isn’t always our friend. In 1914 and again in 1929 it whipped massive fires into raging infernos that left the land bare and blackened. But the people of those desperate times did not give up. In 1929, workers from all over Japan joined with determined townsfolk to saw and hammer and rebuild, and together they completed most of the restoration in about a year. They even mixed Japanese and Western styles, creating a “living museum” of architectural design. So the third key is “the spirit of enterprise,” and it’s by far the most powerful. The survivors of those fires looked at their blackened landscape and saw opportunity, a chance to create new neighborhoods beyond the bounds of tradition. The people of the harbor area again saw opportunity amid the wreckage of the earthquake and tsunami of 2011. Here and there, sturdy old landmarks like this one are being restored. And where there was nothing left to restore, people have cleared away the rubble and rebuilt. Again, the past meets the future as we reinvent our hometown. Let’s take a closer look. Imagine a pizza, round and flat. You cut a narrow slice, and bite off the pointed tip. What’s left is like the original floor plan of the Takeyama building: wide at the street side, narrow at the rear, with the rear section being the old stone warehouse and the narrow wing behind it. The hungry tsunami took its own bite of the tip, so the wing is gone now, and the warehouse is now the tip. Now look down at the sidewalk, and you’ll see lines in the shape of a trapezoid. That’s where the main building once stood. After the 2011 disaster, the road had to be widened by about three feet, so the main building had to be separated from the warehouse and shifted to one side, like cutting your pizza slice crosswise. The annex now fills the void and reconnects the two, but they both keep their original tapering lines. The oddity continues inside. There are various rooms in various shapes, but only one is rectangular. 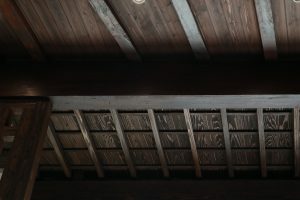 Even the pillars and beams seem askew, some cut to sharp angles, others obtuse, each showing the skill of the woodworkers in the Showa era. Mindful of the previous fires, the builders jacketed some of the structure with sheet metal, copper on the façade and galvanized iron on the sides. You can still see a remnant of the corrugated iron on the west side. There was even a layer of earth under some of it for extra fire protection. The annex is new, but with a nod to the past. It boasts a modern kitchen where the family can cook and even host cooking classes. Through an open door, you get a view of the main building and the stone warehouse. But underfoot is what’s called a “21st century doma,” recalling the doma or earthen floor of long ago.